Columbia, Mo. (June 15, 2015) — An alumna of the Missouri School of Journalism has been awarded a 2015 Pulitzer Prize, the highest honor given for U.S. journalism. Mary McNamara, BJ and BA ’85, television critic for the Los Angeles Times, is the first television critic since 1988 to be honored with the Pulitzer in the criticism category. She was shortlisted for the same award in 2013 and 2014. The Pulitzer judges reviewed 10 of McNamara’s television columns from 2014, each of which shares an awareness for how the arts can provide a catalyst for conversations about social, cultural and political trends – good and bad – in our society. Some of the topics McNamara covered were Stephen Colbert’s exit from Comedy Central, the death of Joan Rivers, diversity in television and the coverage of the Sochi 2014 Winter Olympics. Luckily, her editor’s sources were sterling. The newsroom watched the official announcements together, popped champagne and had a celebratory lunch. That night, McNamara arrived home to a banner and flowers, and celebrated with her husband and three children. McNamara said she feels humbled by the honor, given the many talented critics working at the LA Times and other newspapers all over the country. Mary McNamara served on the staff of The Maneater, an independent newspaper on the University of Missouri campus, before beginning her studies at the Missouri School of Journalism. Photo: MU Savitar. McNamara credits Editor Martin Miller for his stalwart support and encouragement in pushing McNamara to use television criticism as a lens through which to examine sensitive and large issues. “People say, ‘Oh, you take such big swings,’ and the reason I take such big swings is because I have my editors behind me. I know they have my back,” McNamara said. 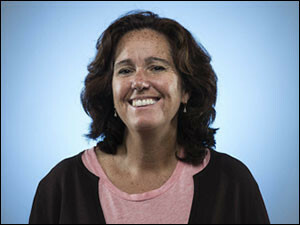 Los Angeles Times’ television critic Mary McNamara became the news when it was announced that she won a 2015 Pulitzer Prize for criticism. Here, colleagues capture her reaction and offer congratulations. One of the many benefits of Missouri, McNamara said, is that the professional newsrooms are a proving ground for students and provide confidence – and clips. McNamara was a reporter at the Columbia Missourian and still considers it her first real job in journalism. McNamara graduated with a dual major in journalism and women’s studies, which paved the way for the job she got after graduation, working at Ms. Magazine. 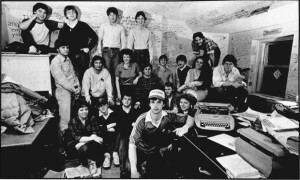 Next was a two-year stop at Whittle Communications in Knoxville, Tennessee, before moving to the Los Angeles Times to be a news editor. McNamara missed writing and after helming the site’s Showtracking blog, was offered a position as a television critic. McNamara said that television criticism is in some ways about answering the basic question: Is this worth your time or not? A larger pattern of criticism that has to do with holding the industry accountable and tracking important trends in television and culture. A selection of her work will be published in a forthcoming anthology of literary journalism by Missouri School of Journalism alumni. Associate Professor Emerita Mary Kay Blakely is the editor.